JKCET stands for Jammu and Kashmir Common Entrance Test. The Jammu and Kashmir Board of Professional Entrance Examination (BOPEE) conducts the JKCET for admission to Bachelor’s of Engineering (B.E). This course is offered by Government and Private Institutes participating in this examination in the state of Jammu and Kashmir. JKCET is a state level exam and will be conducted in the cities of Srinagar and Jammu. JK CET 2018 Registration for engineering programmes had been released on 1st February 2018. The last date to upload the scanned images and submit the application form was 21st March 2018. JKCET 2018 Information brochure – Click here. The final schedule for JKCET 2018 had been announced on the official website i.e. http://www.jakbopee.org/. The entrance exam was conducted on 22nd April 2018 in offline (pen and paper-based) mode. Candidates who wish to pursue engineering at the undergraduate level could take this exam. It is mandatory that the candidates should have studied science subjects like Physics, Chemistry, and Mathematics in 10+2. JKCET provisional Admission list released – Check here. The last day to fill up the preference forms and submit the JKCET 2018 counselling fee has been extended till the 5th June. Know all the details here. The JKCET 2018 Results of those candidates whose results were withheld have been released. Click here to Check the result. The JKCET Mock Exercise of filling Online Preference Forms was available till 23rd May 2018. Click here for the Mock Exercise. All candidates who find their names on the merit list are called for JKCET 2018 counselling. During counselling, candidates will have a chance to choose the course and college of their choice. JKCET 2018 Counselling is held online and candidates have to attend it in person with all the required documents. Candidates will also have to pay a counselling fee of Rs. 500/- which has to be paid at the POS terminal at BOPEE office, Srinagar or Jammu. Seats will be alloted to candidates after the counselling has been conducted. The first round seat allotment list has been released on 24th June 2018. Seat allotment will be based on the merit of the candidate and the choices filled by him during the counselling procedure. Candidates must report to the alloted institute after the seats have been alloted. 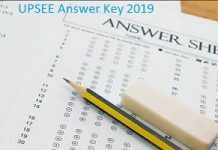 JKCET 2018 Provisional Answer Key has been released – Check here. Jammu and Kashmir BOPEE had published the Answer key of Jammu & Kashmir CET 2018 by 6.00 PM on the day of the conduct of CET Examination. The answer key was made available online for students to check all the answers to the questions asked in the exam. This also gave the candidates a chance to have an idea of their probable score of the exam. Those candidates who have doubts about any answer key can challenge the answer key. JKCET 2018 Admit Card for all candidates has been released Just now! Download Your JKCET 2018 Admit Card Now! JKCET 2018 Admit Card was released on 10th April 2018. An admit card which is also known as the hall ticket is the most important document that the candidate must take to the exam center. The absence of the same can debar him/her from taking the exam as it carries all the important information and acts as a proof that the candidate has filled the application form. Exam center details, the timing and date of the exam, candidate’s name, application number and general instructions to take the exam will be provided on the admit card. The JKCET 2018 Admit Card was available for download on the official website and can also be collected offline (the information of the same will be provided here as soon as it is notified). Every candidate appearing for the examination must know the Eligibility Criteria set by the Jammu and Kashmir Board. Only those who fit the criteria will be eligible to give the exam. The applicant must be a permanent resident of the state of Jammu and Kashmir. Candidate must have passed the class 12th exam from a recognized board with English, Physics, Chemistry, and Mathematics as the subjects. Candidates belonging to the general category must have passed class 12th with at least 50% marks and those belonging to the reserved category like ST/SC must have scored at least 40% in class 12th or equivalent. Students who are appearing for their class 12th examination in the year 2018 are also eligible to apply. The registration window for JKCET 2018 was made available online from 1st February 2018. The last date to register for the examination was 21st March 2018. The first step to take the JKCET 2018 is to fill its application form. The JKCET 2018 Application form had been made available online only. JKBOPEE has announced the tentative date of the exam. Along with this, the last date to fill and submit the application form has also been announced. All applicants will have to register themselves, fill the form, upload the required documents and pay the prescribed application fee. An application fee of Rs 800 has to be paid by the candidate through online “Integrated Payment Gateway”. Exam pattern for J&K CET 2018 is prescribed by the J&K BOPEE. The exam will be conducted in offline mode and candidates will be given a sealed booklet of questions. The questions will be multiple choice. Total duration to take the exam will be 3 hours. Candidates can give each hour to each section depending on their speed. 1 mark will be awarded for each correct answer and 0.25 marks will be deducted for every incorrect response. To know more about JKCET 2018 Exam Pattern. Check here for the Preparation Tips of JKCET 2018. The Result of JKCET 2018 was declared on 10th May 2018 on the official website by the Jammu and Kashmir BOPEE. Candidates will be able to view and download the Result online only. JKCET 2018 result will highlight the scores and rank of the candidate. All candidates must download and take 4-5 prints of the result and preserve it for future use. Candidate obtaining higher marks in Mathematics in the exam will be considered. Candidate having more marks in Physics will be considered. Candidate older in age will be considered for admission.